America’s National Football League (NFL) continues the International Series that started in 2007. Ten years on, it’s playing a record number of four games in London, to mark a decade since the first regular-season match was held in the capital. The Miami Dolphins and the New Orleans Saints battle it out under the NFL London Games banner. The game marks the end of a road trip for the Saints, with September’s schedule granting them only one home game. Will jet lag have set in, or will they manage to break Miami just like the New York Jets did on September 24? Check out this betting preview to see which wagers are worth trying for a touchdown! The money line bet brings us the bare knuckles of the game by asking who will ultimately win. A month ago, even the most saintly Saints fans would have raised an eyebrow if New Orleans had been placed as favourites, but that is exactly what bookmakers have done, offering odds of 8/13, all because of one game. 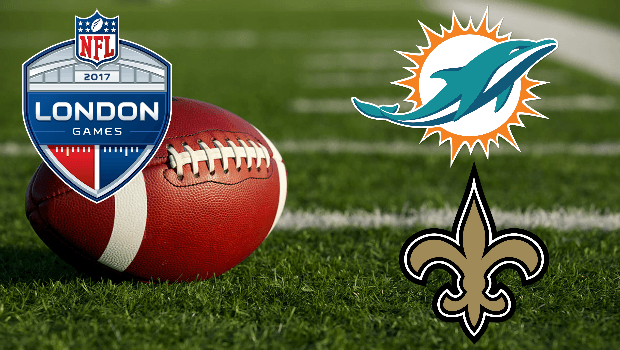 The Dolphins started the season with a slim victory over the LA Charges 19-17, the same weekend the Saints were trampled 36-20 at home by Super Bowl champions, the New England Patriots. However, a comfortable 34-13 victory away in North Carolina against the Panthers made it look like the Saints had hit the reset button. On the same game Sunday, the Dolphins were shut down by the New York Jets, losing 20-6. Even still, the Dolphins are better rested and could present a challenge. With odds of 13/10 at Ladbrokes, it could be very close making it much tougher to confirm where the betting value lies. If you opt to go for a spread bet, the odds grow even tighter than a quarterback gripping the ball. If the Dolphins win by more than three points (+3), Ladbrokes is offering 19/20. If the Saints lose by the same amount or more (-3) then you could get odds of 17/20. Worth noting, this is the most popular market for US bettors. The winning margin odds tell a similar story to the other odds – that the top NFL bookmakers think the Saints will win, but with the teams evenly matched, the odds are pretty close. For a small win of between one to six points, Ladbrokes is offering 3/1 on the Dolphins, and 5/2 on the Saints. A more comfortable win of between seven to 12 points expands the odds to 5/1 for the Dolphins and 4/1 for the Saints. The Dolphins lost their last game by 14 points to the New York Jets, one of the worst teams in the league. If they were to lose to the Saints within a similar bracket (an outcome they hope does not come to fruition), between 13 to 18 points, then Ladbrokes will pay out at odds of 11/2. However, if the Dolphins manage to backflip their bad luck and win by this, then you would be even more quids in with a wager at 17/2. Although each quarter of the game is only 15 minutes, NFL games usually last between three to four hours depending on gameplay and if overtime is involed. Impatient gamblers can take a chance on a 60-minute bet, which will be based on the result at the end of the first hour of play, regardless of where the game is headed. If Dolphins head coach Adam Gase makes as many changes as he did prior to meeting the Jets, it could offer a better start, or an equally miserable one. Ladbrokes holds the chance of the Dolphins leading after the first hour at 11/8, while the Saints are at 8/11. An interesting long shot is if the game would be tied at this point. With odds of 16/1 that it is neck and neck, it is an attractive proposition. The bookmaker is also offering the same bet but with handicaps attached. A 60-Minute bet with a +1 handicap in the Dolphins’ favour sees only a slight shift in the odds, with the Dolphins down to 23/20 and the Saints still sitting comfortably at 8/11. Again, the interesting bet to watch is the tie, which jumps up to 20/1. For those who have no vested interest in the game but still fancy a punt, the Total Points betting offer worthwhile odds for a generous return, although working out what the two teams together will score can be tricky. For a total point range between 45 and 48, Ladbrokes is offering 6/1. If the combined points are less than 45, you could get odds of 7/4, and over 48 is the slightly lower at 7/10. Pushing the limits up slightly, Total Points betting between 49 and 52 and 51 and 54 both have odds of 11/2. Although it is highly unlikely, if the game produces a storm of tries and touchdowns that send the point total over 54, Ladbrokes has odds of 6/4. There is also the odd/even total point bet, with an odd number favourite at 7/10, and even holding at 6/5. So if you think you can call a winner from these two NFL teams while they play on the other side of the pound, why not visit Ladbrokes today for a wager? If you join now and bet just £10, Ladbrokes is offering £30 in free bets!